5 For May Day and Beyond: White People Step up for Immigrant Rights! Maria Poblet... is the Executive Director of Causa Justa/Just Cause. She is Chicana and Argentine, and has more than a decade of experience in Latino community organizing in the Bay Area. At St. Peter’s Housing Committee, María was instrumental in transforming a service provision model into a membership and organizing structure, and a grassroots leadership development and political education program. In 2009, she helped lead the merger between St. Peter’s and Just Cause Oakland that created Causa Justa/Just Cause. She is a leader in grassroots movement building work, including the Grassroots Global Justice Alliance. Maria had the privilege of being mentored for many years by June Jordan, is an avid writer, and was the Artistic Director of Poetry for the People before she fell in love with community organizing. Born in Buenos Aires, Argentina, in the late 1970s Maria Poblet,immigrated to east Los Angeles in the mid-1980s. "I thought the U.S. would be like a TV show; people would be thin, wealthy, white," she says. "But, instead, I saw poverty where I thought it did not exist, and people of color that I did not know lived here." As a student at UC Berkeley, Poblet jumped into the campus fight to preserve affirmative action-where she met Harmony Goldberg-then running SOUL out of her apartment. In 1998, Poblet signed up for SOUL's first summer school session, interning at the Oakland hotel workers' union local. "When we learned about civil disobedience, I thought we should take over the hotel manager's office. But that was not the proper strategy. It was humbling," Poblet says. "I learned that I could not create The Movement by myself." In 2002 Maria Poblet and and Marianna Viturro gave a teach-in entitled: "Pan y trabajo: The People’s Movement of Argentina." The classes were held at the San Francisco based Center for Political Education, an organization closely associated with the Committees of Correspondence for Democracy and Socialism. In 2002 Maria Poblet of St. Peter’s Housing Committee; Zulfiqar Ahmad a Pakistani scholar and activist; Eyad Kishawi of the American-Arab Anti-Discrimination Committee]]; Richard Becker of the International ANSWER Coalition and Co-sponsored with the American-Arab Anti-Discrimination Committee, the School of Unity and Liberation and War Times gave talks entitled: "Anti-war Activist Dialogues." The talks were held at the San Francisco based Center for Political Education. Circa 2005 the Catalyst Project held a lecture"Reclaiming Revolution: A study of the history and lessons of STORM" (Standing Together to Organize a Revolutionary Movement), a multi-racial, internationalist, left cadre organization based in the Bay Area from 1994-2001. Speaking on STORM's history were Harmony Goldberg, Maria Poblet, and Jason Negron-Gonzales. People trained by SOULare seeded throughout the nonprofit world of social work in San Francisco and Oakland. Maria Poblet is employed as an organizer for St. Peter's Housing Committee, an agency that counsels immigrant tenants in San Francisco's Mission District. She is also a poet whose writings on poverty and revolution have been published by Doubleday and the University of California Press. Alicia Garza, Adam Gold, Stacy Kono, Danielle Mahones, Genevieve Negron-Gonzales and Maria Poblet. ...queer Latina poet. She has studied poetry under the direction of June Jordan and Martín Espada. She served as Artistic Director of June Jordan's Poetry for the People, and taught poetry workshops at Mission Cultural Center, FCI Dublin Women's Prison, and Yerba Buena Center for the Arts. Her work has been featured in the SF Weekly, Revolutionary Voices, and the Street Sheet. She has been a community organizer in San Francisco’s mission district since 1999, fighting for immigrant Latino tenants’ rights. She agrees with Cape Verdian revolutionary Amilcar Cabral that culture is a weapon in the fight for freedom, and can often be found reading poetry through a bullhorn. Causa Justa/Just Cause (San Francisco/Oakland, CA) - Maria Poblet . Grassroots Global Justice Alliance activists attended the World Social Forum 2013 held in Tunis, Tunisia. Delegates included Kali Akuno (MXGM), Jordan Flaherty (Floodlines), Maria Poblet (CJ/JC), Helena Wong (CAAAV), Erin Byrd (BWFJ), Autumn Martinez (UE 199), Cindy Wiesner (GGJ), Charity Hicks (EMEAC), and Tammy Bang Luu (LCSC). Attendees included Maria Poblet - Causa Justa/Just Cause Executive Director. October 23, 2015 The 4th Americas Regional meeting of the World March of Women opened in Cajamarca, Peru. There were 4 reps from the WMW US/ Grassroots Global Justice Alliance chapter there reclaiming feminisms from the grassroots. Two co-chairs: Maria Poblet and Jessica O. Guerrero, along with Emma Sandoval and staff Helena Wong. 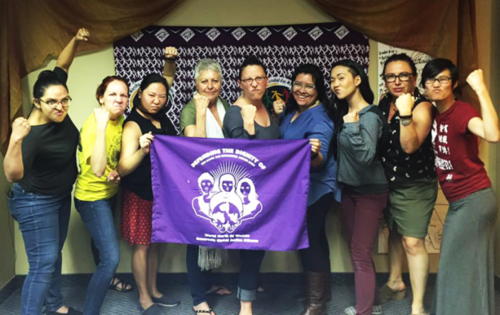 Grassroots Global Justice Alliance and the SouthWest Organizing Project (SWOP) co-hosted our very first Feminist Organizing School (FOS2016) in Albuquerque, NM from May 20-24th 2016. Over 40 people from 17 organizations around the country participated in the school, grounded in the spirit of slain indigenous feminist environmental activist, Berta Caaceres. August 24, 2016, Cazembe Jackson, National Organizer of Freedom Road Socialist Organization sent a Spanish version of Freedom Road's 20016 election strategy on Facebook to several "language justice" activists, including Rosa Ponce, Hermalinda Cortes, Xochitl Bervera, Tristan Call, Salem Acuna, Maria Poblet, Marisa Franco, and Brenda Perez. Signatories included Maria Poblet, executive director, Causa Justa/Just Cause. Those invited, on Facebook included Maria Poblet. From an article on Organizing Upgrade October 5, 2018 on the :Left Inside/Outside Project. Signatories included Maria Poblet, LeftRoots. I am honored to have been elected by the people of Berkeley to serve as Rent Stabilization Board Commissioner! Thrilled that our whole progressive slate won, including the newbie to the board, Soli Alpert who is only 21 years old, a Cal student, and a democratic socialist. Rollin up my sleeves to build community-based solutions to the housing affordability crisis, with these smart, committed folks over the next four years! Pueblo que lucha gana!! Housing is a Human Right!! — with James Chang and Soli Alpert. This page was last modified on 9 March 2019, at 01:12.